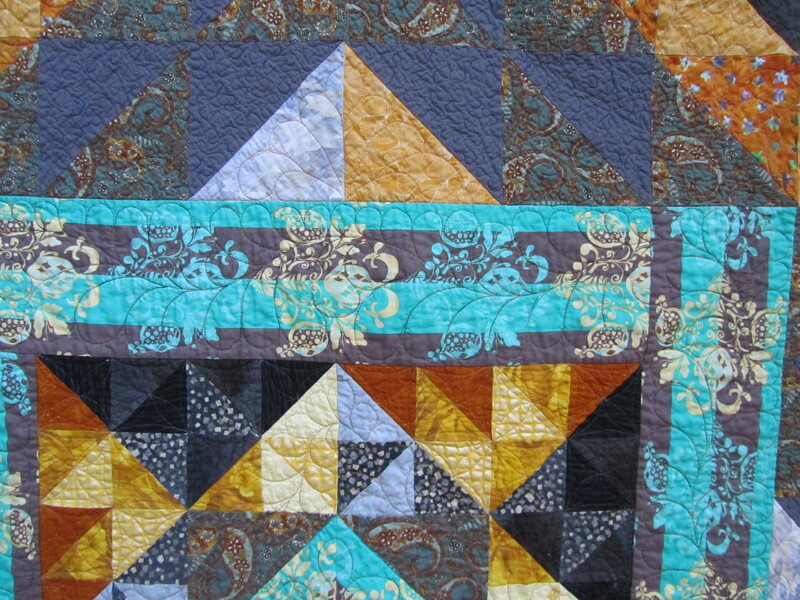 Turquoise and Gold Quilt Finished! Here it is, on a sunny morning on the fallen leaves. The colors fit right in for fall, don’t they? This was one of my few UFOs, but it was an old one. I’m guessing six years it sat in my cupboard, but I can’t really date it for sure. It started as a wall hanging. I pulled it out earlier this year and asked the Twilters if they saw any potential in it, and they were enthusiastic. This doesn’t look like anything I’m doing now, does it? Playing with color and value, looks like I spent lots of time with it on the design wall. The center had some already cut borders and binding with it, as well as a couple yards of backing fabric. 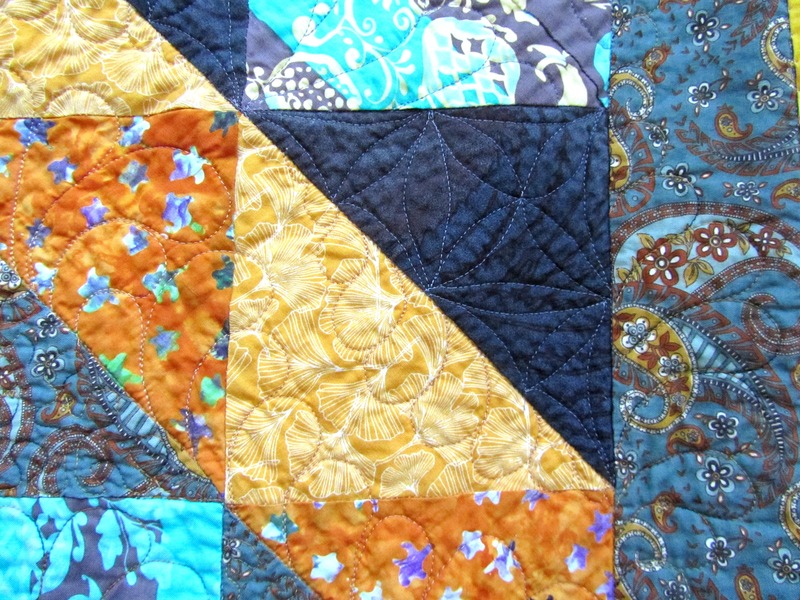 I still wasn’t feeling the wall hanging, so I decided that all that fabric should become a quilt. Notice I worked with much bigger triangles. After I sewed that bottom section on right side up it didn’t look too bad. I quilted it with lots of feathers, some stippling, and some orange peel. 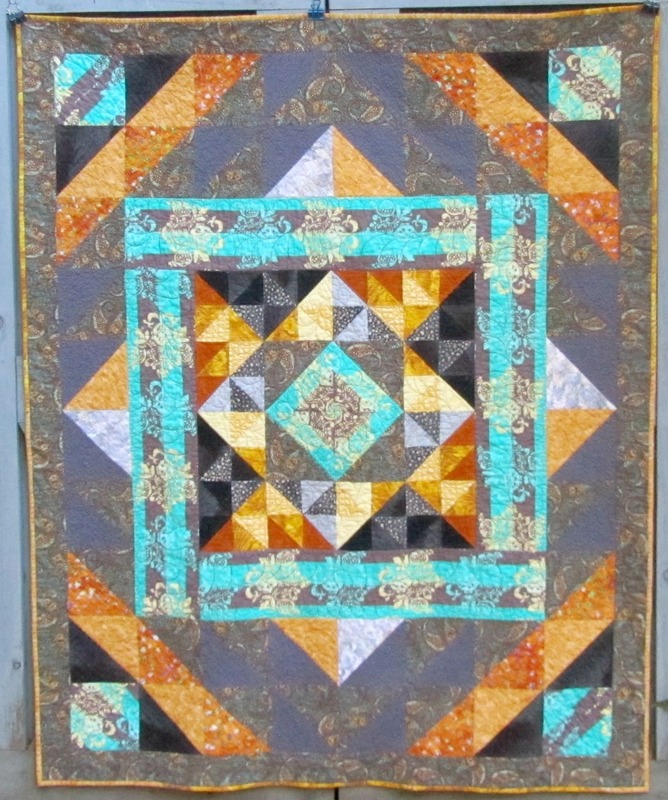 The mid-tone areas are done with Superior’s So Fine in a variegated mustard/navy color. I tried that on some of the lighter areas, but it did not look good, and I don’t ever want to rip out feathers again. Ugh. I know that, forced to decide, I always prefer the thread to be lighter than the background instead of darker. I know this. I just need to believe it and practice it. I replaced that stitching with a golden Living Colors thread on the yellow and light gray areas, and used a Sulky dark gray on the dark gray to black spaces. The bobbin thread is Bottom Line in a medium gray. I really love the back. This was narrowish JoAnn fabric, so I had a chance to piece lots of scraps into it. I think it pops. 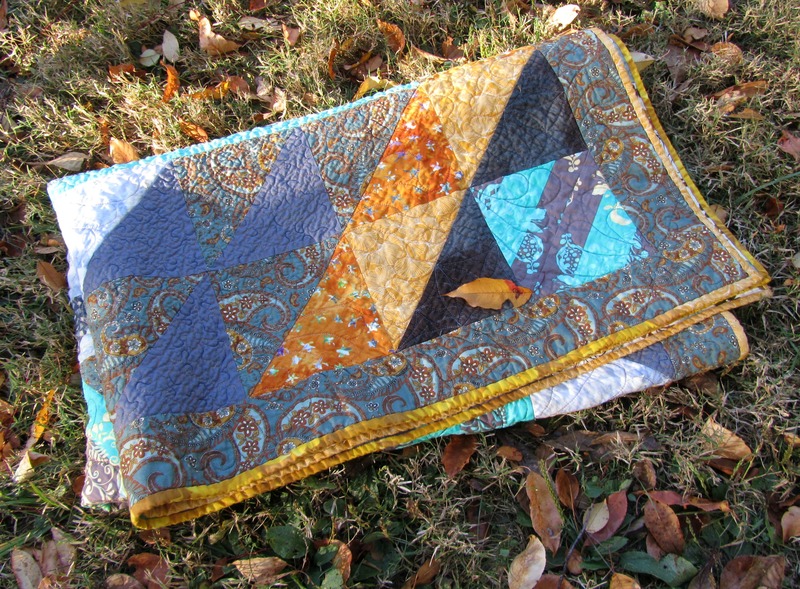 When I was trimming this quilt to bind, it suddenly told me it wanted to have wavy edges to match the half feathers I had quilted into the narrow border. I told it no, though. After days of stitch picking, I was ready to finish it up quickly, and I already had all the straight grain binding cut. So it has straight edges. I managed to use up almost all of the fabric, except for some of the turquoise, which I am eyeing for an upcoming project. I’m linking up to Whoop Whoop Friday and WIPs Be Gone. Categories: Finishes | Tags: Evening in the Garden, finish, superior thread, Valerie Root | Permalink. Wow, I love these colours! The combination of gold and grey is beautiful! 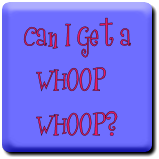 You can definitely get a whoop whoop! 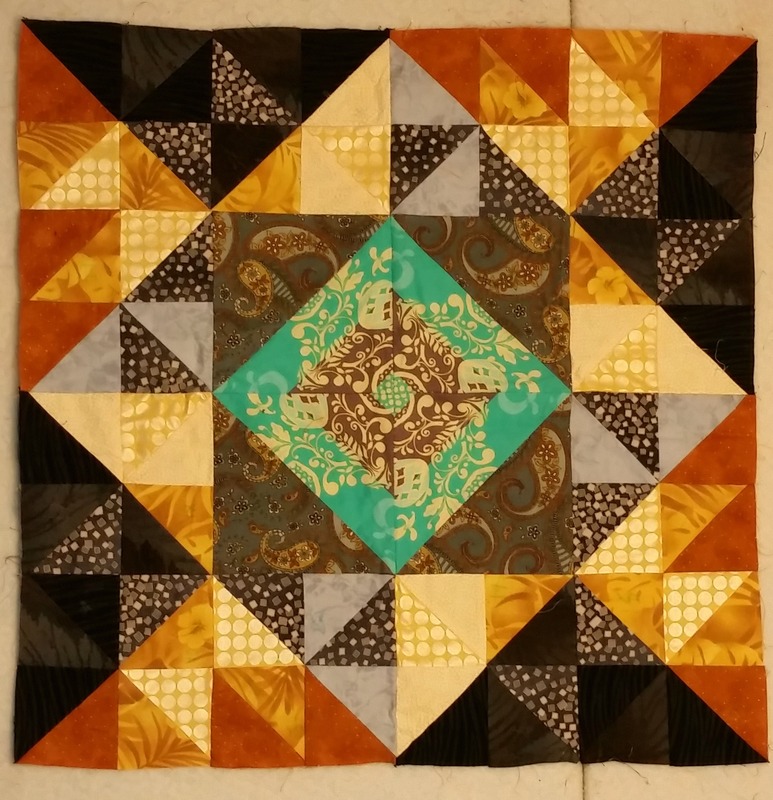 Great quilt, congrats! 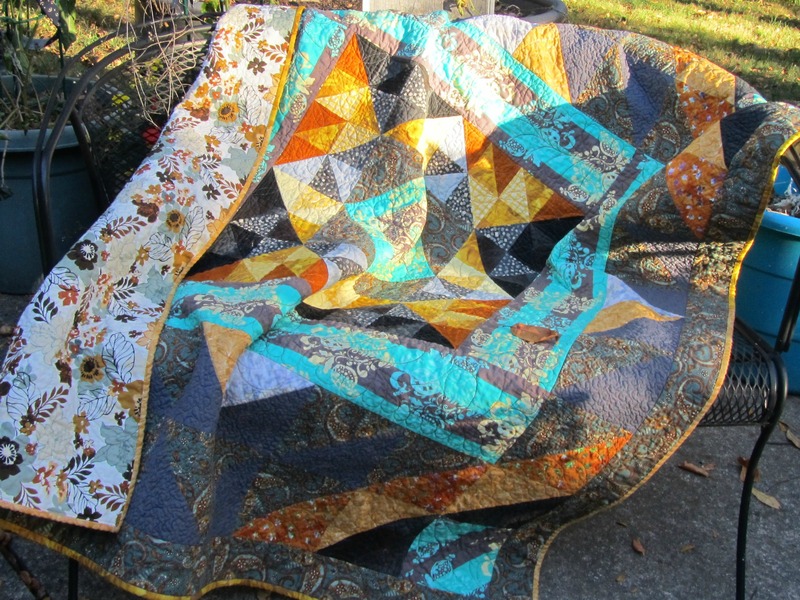 This is a great quilt! I really think you did a nice job! This is stunning! I love ensuring about it, and the back is a real treat too! 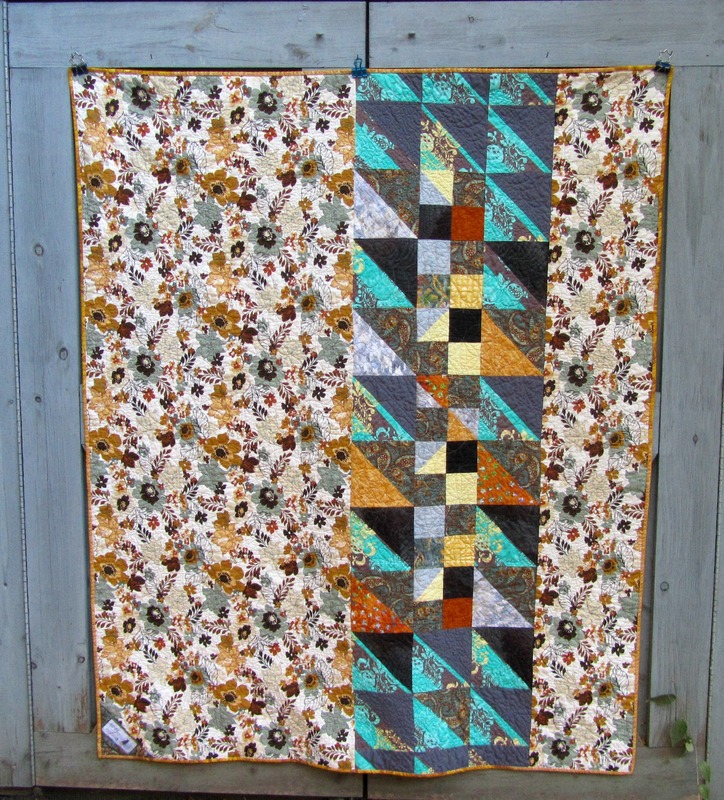 Great quilt, great quilting and a fun read – I learn so much from these kinds of posts. Thanks, Valerie! Beautiful! Love the colors. 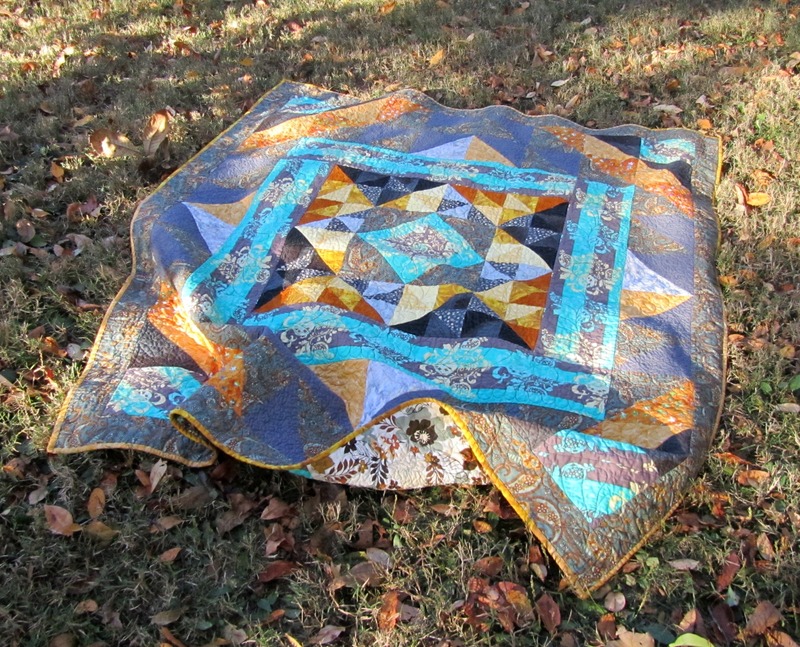 Came by way of A Quilting Reader’s Garden and am new to your blog. Will be sure to come back!